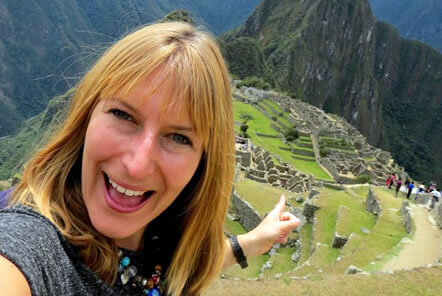 While visiting our volunteer projects in Peru I spent a day exploring the wonders of Machu Picchu. It is included on many bucket lists and it is clear to see why, it is a truly impressive breath-taking site! I organised a day trip from Cusco, which included a spectacular train ride from Ollantaytambo to Aguas Calientes, leaving Cusco at 4am and getting back at just after 8pm. Many people recommend spending a few days in Cusco to adjust to the altitude sickness, but Machu Picchu is located at an altitude 2,450m which is much lower than Cusco which is at an altitude of around 3,400m so I think it’s an ideal day trip even in your first few days in Peru. Machu Picchu was built during the Inca Empire around 1450 but was abandoned in 1572 when the Spanish arrival in Peru. It was "discovered" by explorer Hiram Bingham III in 1911, when it is thought that he was looking for a different city, known as Vilcabamba. When he found Machu Picchu there were 2 families already living in the ruins and the young boy was the very first tour guide and took him around the overgrown site. Not all of the ruins you can see today are original, around 30% of it has been restored and reconstructed over the years. Wear long trousers - It doesn’t seem to matter how much insect repellent you put on the Machu Picchu sand flies have a thing for exposed legs so to avoid having polka dot legs by the end of the day make sure your legs are covered. 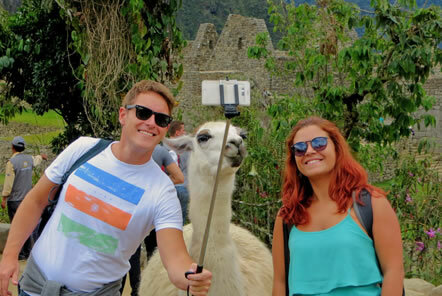 Recharge your batteries - There are photos opportunities after every steep footpath, with the view and aspect of the site constantly changing so make sure your camera is fully charged to avoid missing out on the perfect lama selfie moment! Don’t lose track of the time - Aguas Calientes is the town which is located at the bottom of Machu Picchu and there is only 2 ways down from the site, bus or walk. The walk is a steep climb which takes over an hour or the take the bus. The queue for the bus is often very long (especially between 11am and 4pm) so make sure you leave yourself at least 45 minutes for the queue plus the 25 minute windy bus ride down. Spend time wandering - I easily lost track of my 4 hours at the site and wished I had more time to explore. A lovely walk to the sun gate (where hikers arrive at dawn to watch the sunrise over Machu Picchu) gives a great view down onto the old town. Refuel - Bring water and snacks as there isn’t anywhere in the site to buy these. There is a great picnic stop just up from the coach stop which I’d say has the best views on earth to accompany a cheese sandwich and crisps. Be-prepared - Bring clothing for all weather as in the region the weather can change very quickly and doesn’t always follow the promised weather forecast! Don’t forget your rain coat, fleece, sun lotion and light weight long sleeve top as there is little escape if the sun does appear. 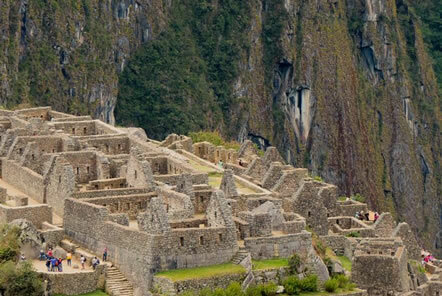 Book in advance - There is a cap of 3,000 day tickets to Machu Picchu released each day so it’s best to book several weeks (or months) in advance to ensure you don’t miss out on this incredible site. If you would like to book our trip to Machu Picchu you can contact the lovely team at Student Universe and they can help you arrange everything for your trip. Gemma is a Placement Manager at Pod Volunteer and visited Machu Picchu before joining our Amazon Conservation project in Peru.